​1. Using the tip of a toothpick gently remove the tag from the backing sheet. Do not touch the adhesive side as the oils on your skin could affect the longevity of the glue. Put the toothpick with the tag on it to one side. 2. Let the butterfly walk onto your finger by putting your finger right in front of the butterfly’s head. Or hold all four wings together (with a scissor grip) and then place one finger from the other hand underneath the body of the butterfly using just enough pressure to encourage it to let go of what it is holding onto. 3. Using that scissor grip you should be able to hold all four wings at once between your two fingers, close to the butterfly’s body so that you can see most of the wings. 4. 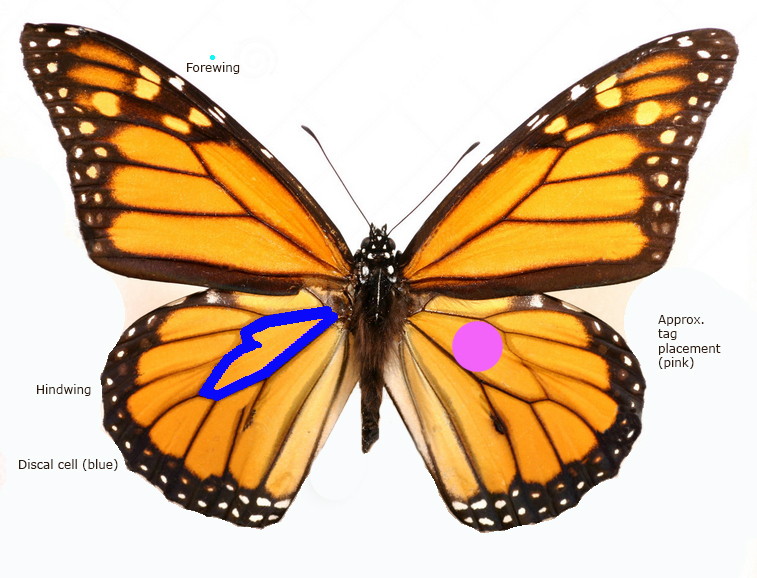 Place the tag on the central discal cell of one of the hind wings (the discal cell is the shape of a stretched mitten – coloured blue in the picture). The tag should be visible when the wing is closed. Placement is shown by the pink circle. Either hindwing can be used. 5. Roll the toothpick out of the way and press the tag gently in place with your thumb for a few seconds to ensure that it’s firmly stuck. 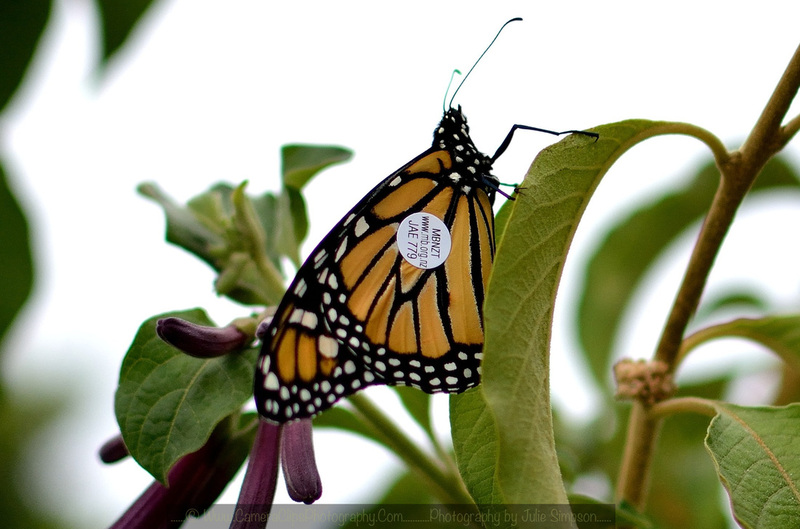 From 1 March onwards, each year, any New Zealand Monarch Butterfly emerging from its chrysalis should be tagged. How do you get tags? First you need to register on the Moths & Butterflies NZ Trust website (it's free) and set yourself up with a user name and password. Once you have registered you can request tags (after February each year). Login to the Moths & Butterflies NZ Trust website and select ‘Dashboard’ on the home page. Under the ‘Research’ tab, select ‘Request Tags’. If you are new to tagging and want to practise first you can also order practise tags and paper butterflies. These are free. When can you order tags? Each year there is a new series of tags and these can be ordered from February onwards. Tagging begins on 1 March so we can tag the last generation of Monarchs for the season, and continue tagging until the last butterfly emerges. We do not tag all year round. Monarchs that we tag after 1 March in any given year are likely to overwinter. We hope to be able to find them returning to gardens in the spring – or at their overwintering site. Butterflies that emerge during the spring and summer are likely to reproduce and continue the species. Learn more about our Citizen Science projects below by clicking on the links. If you have any additional questions once you have registered, please post them in the forum. 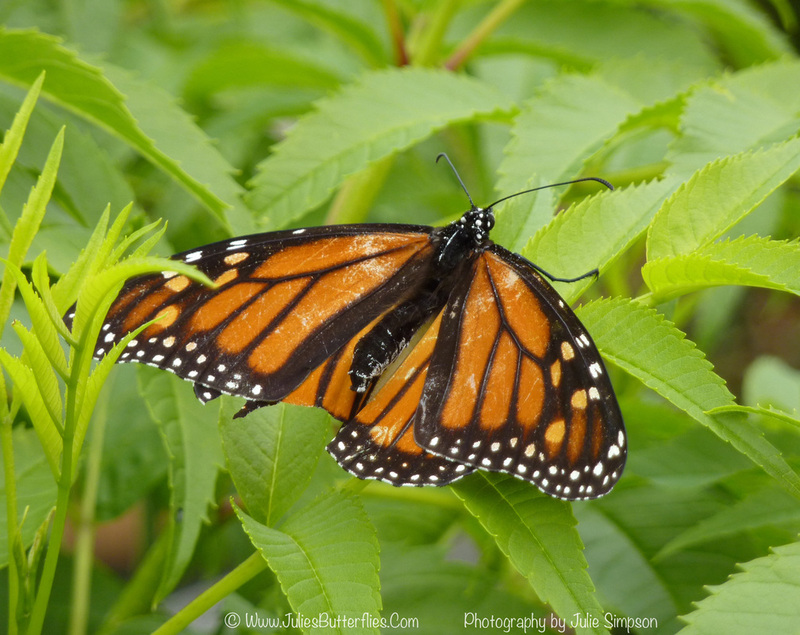 What is the Monarch butterfly tagging programme? How do I join the Monarch butterfly tagging programme? Firstly you need to register. It is absolutely free to join! On the home page and select ‘Register’. You will need to select a Username which you cannot change, so choose wisely. You will receive an email with a password in it which you will be able to change to something more memorable. When the email arrives, login with your Username and the password emailed to you. We suggest you copy and paste the password in – and then change it. When registering, slowly type your physical address into the address bar allowing the system to search for your address as you enter it. When the correct address is showing, highlight it from the dropdown list, and you will note that the correct geographic co-ordinates appear in the box below. What are these ‘tags’ and how do they work? When you receive your tags you will see that they come in sheets of 25. That means you can potentially tag 25 butterflies from one sheet of tags. The tags are numbered from the left-hand side downwards in five columns of five tags each. Each tag has a unique number. When you request tags we record the numbers of the tags assigned to you alongside your Username. You will be able to see the tag numbers in the dropdown menu of your profile. Under the ‘Research’ tab select ‘Tag Butterfly’. Each year we use a new series of tags and older ones are discarded or used to practise – but not on real butterflies please. When you tag and release a butterfly you will need to record the details online. Make sure you use the tags in numerical order. The tags are manufactured in the United States specifically for our project. They are made of polypropylene containing special 3M glue on one side for fixing to the butterfly’s wing. They can last in all weather for up to a year. 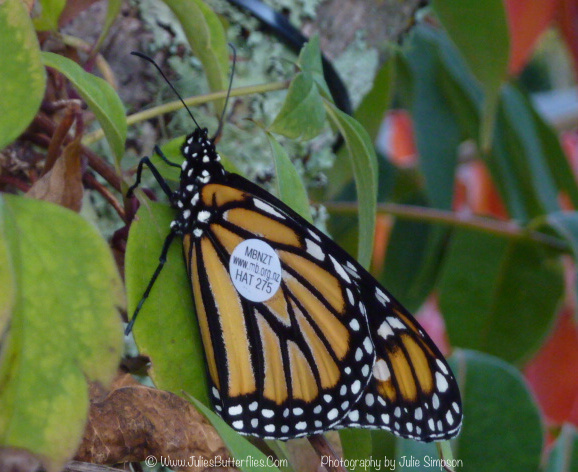 How can you check to see if anyone found your tagged butterfly? Log in and then select ‘Dashboard’. Click on the ‘Research’ tab and then ‘Tag Recoveries’. On this page you can find the results of all tags recovered each year. You will also receive an email if any of your tagged butterflies are found. Alternatively you can scroll through the list to search for the your tagged butterflies. Only recovered butterflies are displayed. You found a tagged butterfly. Where do you record that you found it? From the home page, select ‘Report a sighting: Butterfly or Pest’ or go to www.mb.org.nz (this address is also printed on the tags). Enter the details of the butterfly you found such as where you found it etc. 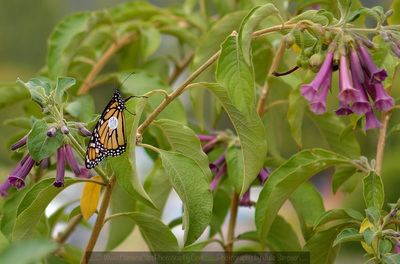 In North America the recovery data is posted on Monarch Watch’s website and is analysed to test hypotheses concerning Monarch orientation and navigation. The data are also used to determine mortality during the migration and estimate the number of Monarchs in the overwintering population. These analyses are summarised on their website subsequent to the publication of the articles in scientific journals. 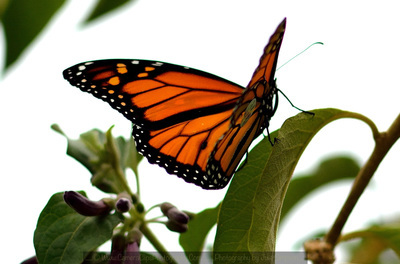 This provides useful information in a way that avoids hurting or harming the butterflies. 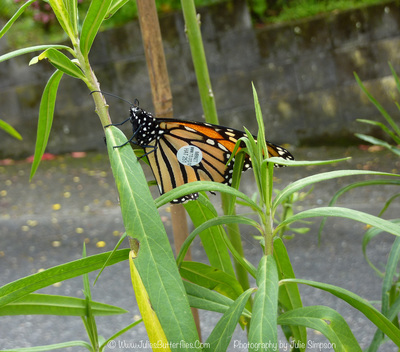 Here in New Zealand, while we respect the personal details of both our taggers and those who find tagged Monarchs, and keep this information confidential, we are happy to share the information captured with anyone who would like to use the information for scientific research. This includes students as well as professional and amateur scientists. Send a request to trust@monarch.org.nz.